Looking for a great investment property at the beach? 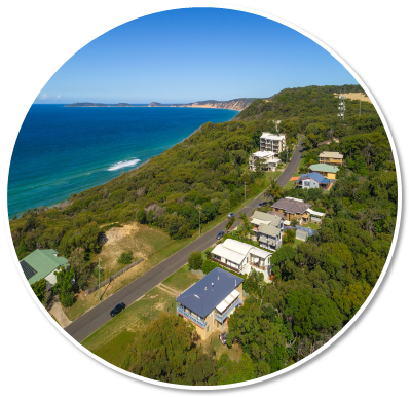 This property has been renovated, extended, improved, landscaped, fixed and finished to now become one of the most popular holiday rentals in Rainbow Beach. Located in Rainbow Shores estate you’re just a few minutes walk to the beach and surrounded by greenery. The yard has been fully landscaped to be a great entertaining area year-round with the gazebo, inground pool, mini-putt putt course and fire pit. The house has been built in two pavilions with a large covered breezeway between. With three bedrooms, ensuite and bathroom their is room for 6 people. The living spaces include the large open plan kitchen, living, dining area that overlooks the pool area, as well as a separate kids tv room. At the front of the property the owners have gone above and beyond to cater for fishermen and caravaners. With multiple spaces for vehicles, washdown areas and space still to park your boat or caravan this is an easy and usable property to access and enjoy. The property has been set up as a holiday rental and has become one of the most popular rentals in the market with occupancy of over 80% in 2018. With significant forward bookings, management and support already in place, and solar power and hot water to help keep costs down, this is an investment that stands above the crowd. Inspections by appointment, call Andrew Hawkins today to arrange your viewing.